This Chalkboard Easel Is Available for Expedited Shipping. Over 100s of Units Are In-Stock. 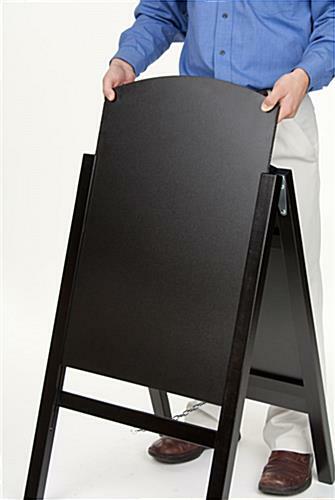 Get This Chalkboard Easel by 1pm EST (M-F) to Received Fast Shipping. Two, slide-in 18" x 26" blackboard enables users to easily write messages on a table. Top hinges allows the a-frame to fold flat for easy storage and portability. 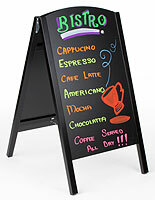 Black wood frame is appropriate for use in restaurants, retail stores or service businesses. 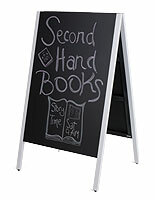 Textured black board designed for use with regular stick chalk, liquid chalk markers and wet-erase neon pens. 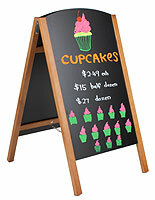 An a-frame blackboard, chalkboard easel is a perfect way to publicize alluring messages. By using this write-on board, it can help grab attention and as a result, will increase the number of customers in your establishment. 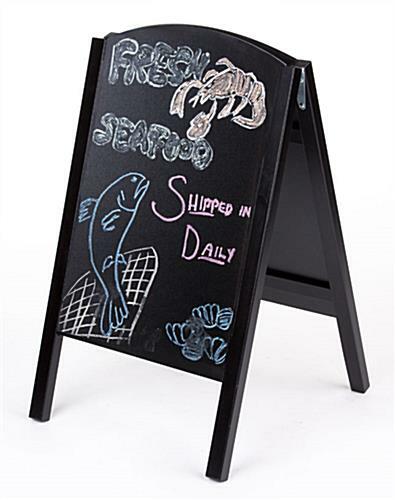 This chalkboard easel, also known as a-frame blackboard, has a wood frame with a black finish that blends in perfectly to any environment. Each unit has two slide-in chalkboards that are 18" wide by 26" high, giving users plenty of space to create their own messages. 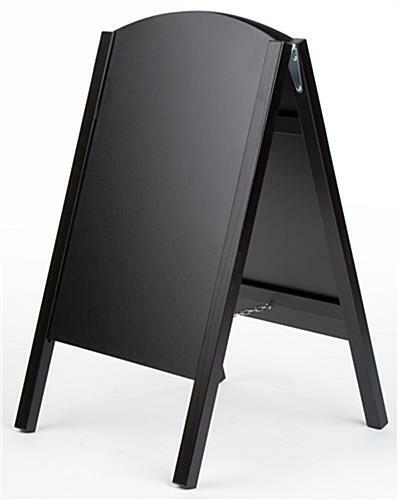 Business can use this chalkboard easel that has a black wood frame to advertise sales events, daily specials, on-going promotions and announce important information. Passersby's coming from both directions will be able to view the message on the board. 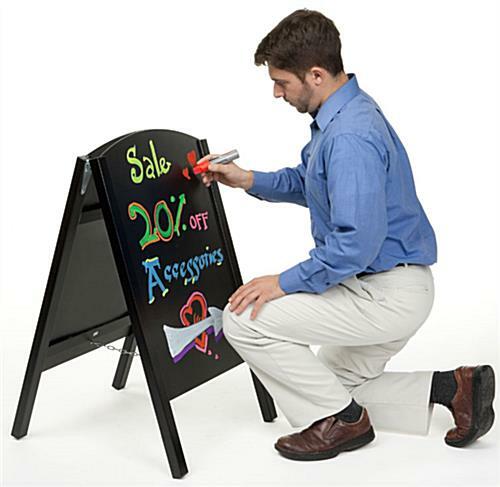 This write-on blackboard, a-frame chalkboard easel that is double-sided enables advertisers to use both sides to create their custom messages. One of the best features about this a-frame is that the slide-in blackboards allow advertisers to write a message on a table, then insert the board into the frame. 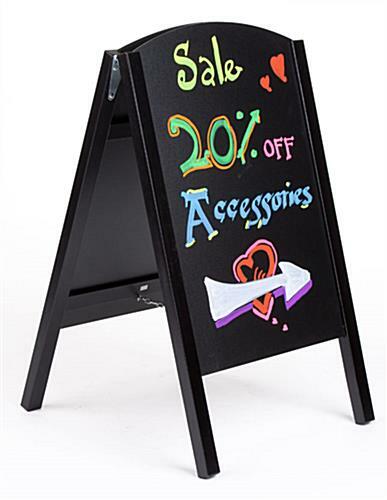 Messages can be written on this sidewalk chalkboard easel that has a black textured board using traditional stick chalk, liquid chalk markers and wet-erase neon pens (sold separately). The blackboard can be easily clean off by using any damp cloth. If users experience any difficulties in cleaning the black textured surface, they can use the magic eraser provided with the unit. The magic eraser can help clean-off the ink from the board. 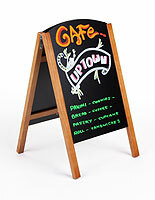 These a-frame blackboards are perfect for places that require frequent advertisement changes such as restaurants, bars, cafés and retailers. This write-on board is meant for use indoors, however, they can also be displayed outside but under fair weather conditions. A sidewalk write-on board, like the one seen here, commands attention no matter where it is placed in. When not in-use, the unit can be folds together for easy storage and portability.